"Hors d'œuvres" redirects here. For the Roy Harper song Hors d'œuvres, see Stormcock (album). In European cuisine an hors d'oeuvre (/ɔːr ˈdɜːrv(rə)/; French: hors-d'œuvre [ɔʁ dœvʁ] ( listen)), appetizer or starter is a small dish served before a meal. Some hors d'oeuvres are served cold, others hot. Hors d'oeuvres may be served at the dinner table as a part of the meal, or they may be served before seating. Formerly, hors d'oeuvres were also served between courses. Hors-d'œuvre in French literally means "outside the work" — that is, "not part of the ordinary set of courses in a meal" or perhaps more accurately a dish which is appendant to or supportive of the main course. The French spelling is the same for singular and plural usage; in English, the typographic ligature ⟨œ⟩ is usually replaced by the digraph ⟨oe⟩, with the plural commonly written hors d'oeuvres and pronounced /ɔːr ˈdɜːrvz/. The hors d'oeuvre is also known as the starter or entrée. A small number of food historians believe that the tradition may have begun in Russia, where small snacks of fish, caviar and meats were common after long travels. [self-published source] However, it may be that the custom originated in China, possibly coming through Steppes, into Russia, Scandinavia, France and other European countries. The tradition may have reached Italy, Greece and the Balkan nations through Russia or Persia. 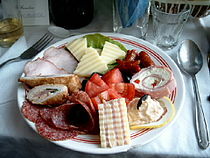 Many national customs are related, including the Swedish smörgåsbord, Russian zakuska, Lebanese mezze, and Italian antipasto. During the Roman Period the meal practice was to have two main courses which were supplemented before the meal with small amounts of fish, vegetables, cheeses, olives and even stuffed dormice. These would be served at the start of the meal known as either gustatio or promulsis. The Greeks called the appetizer course propoma. During the Middle Ages formal French meals were served with entremets between the serving of plates. These secondary dishes could be either actual food dishes, or elaborate displays and even dramatic or musical presentations. In the 14th century, recipes for entremets were mostly made with meat, fish, pork and vegetables. By the 15th century the elaborate display and performances were served up between courses, and could be edible or displays of subjects relevant to the host, created in butter sculpture or other types of crafted work. With the introduction in the 17th century of service à la française, where all the dishes are laid out at once in very rigid symmetrical fashion, entremets began to change in meaning but were still mainly savoury. Along with this came elaborate silver and ceramic table displays as well as pièces montées. The entremets were placed between the other dishes within the main work of the meal. At about this time in the 17th century, smaller dishes began to be served by being placed outside the main work of symmetrically placed dishes. These were known as hors d'oeuvre. Hors d'oeuvres were originally served as a canapé of small toasted bread with a savoury topping before a meal. The first mention of the food item was by François Massialot in 1691, mentioned in his book: Le cuisinier roial et bourgeois (The Royal and Bourgeois Cook) and explained as "Certain dishes served in addition to those one might expect in the normal composition of the feast". In the French publication Les plaisirs de la table, Edouard Nignon stated that hors d'oeuvres originated in Asia. He went on to state that the French considered hors-d'oeuvres to be superfluous to a well cooked meal. Service à la française continued in Europe until the early 19th century. After the 19th century the entremet would become almost exclusively a sweet dish or dessert with the British custom of the "savoury" being the only remaining tradition of the savoury entremet. The style of formal dining changed drastically in the 19th century, becoming successive courses served one after the other over a period of time. Some traditional hors d'oeuvres would remain on the table throughout the meal. These included olives, nuts, celery and radishes. The changing, contemporary hors d'oeuvres, sometimes called "dainty dishes" became more complicated in preparation. Pastries, with meat and cream sauces among other elaborate items, had become a course served after the soup. Food in England is heavily influenced by other countries due to the island nation's dependence on importing outside goods and sometimes, inspiration. Many English culinary words and customs have been directly borrowed from the original French (some completely Anglicized in spelling) such as: cuisine, sirloin, pastry and omelette which came from the 18th century and earlier. In the late 19th and early 20th century, even more words, foods and customs from culinary France made their way into England, such as éclair, casserole, à la carte, rôtisserie and hors d'oeuvre. 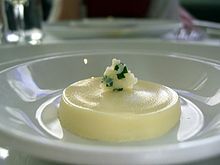 The custom of the savoury course is of British origin and comes towards the end of the meal, before dessert or sweets or even after the dessert, in contrast to the hors d'oeuvre, which is served before the meal. The British favored the savoury course as a palate cleanser before drinking after the meal, which made the hors d'oeuvre before the meal unnecessary. The savoury is generally small, well spiced and often served hot, requiring cooking just before serving. In the Victorian and Edwardian periods, savouries included such toppings as fried oysters wrapped in bacon, and Scotch woodcock, which was a savoury made of scrambled eggs, ground black pepper and Gentleman's Relish on buttered toast, served hot. In France, cheese was often part of the savoury course or added with simple fruit as a dessert. A typical Edwardian dinner might consist of up to four courses that include two soups, two types of fish, two meats, ending with several savouries then sweets. The term appetizer is a synonym for hors d'oeuvre. It was first used in the United States and England simultaneously in 1860. Americans also use the term to define the first of three courses in a meal, which were optional and generally set on the table before guests were seated. Drinks before dinner became a custom towards the end of the 19th century. As this new fashion caught on, the British took inspiration from the French to begin serving hors d'oeuvres before dinner. 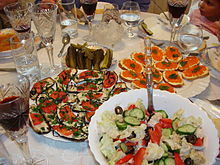 A cocktail party is considered a small gathering with mixed drinks and light snacks. 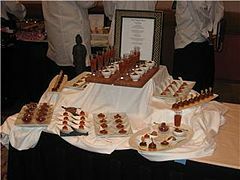 Hors d'oeuvres may be served as the only food offering at cocktail parties and receptions, where no dinner is served afterward. After the end of prohibition in the United States, the cocktail party gained acceptance. Prior to the First World War, American dinner guests would be expected to enter the dining room immediately where drinks would be served at the table with appetizers. This changed by the 1920s, when hors d'oeuvres were served prior to a non-alcoholic cocktail; however, after the repeal of Prohibition in the United States, cocktail parties became popular with many different hors d'oeuvres meant as something to help counter the stronger drinks. It is the cocktail party that helped transfer the hors d'oeuvres from the formal dining table to the mobility of the serving tray. These appetizers passed around the cocktail party may also be referred to as canapés. In restaurants or large estates, hors d'oeuvres are prepared in a garde manger which is a cool room. [page needed] Hors d'oeuvres are often prepared in advance. Some types may be refrigerated or frozen and then precooked and then reheated in an oven or microwave oven as necessary before serving. If there is an extended period between when guests arrive and when the meal is eaten, for example during a cocktail hour, these might serve the purpose of sustaining guests during the wait, in the same way that apéritifs are served as a drink before meals. It is also an unwritten rule that the dishes served as hors d'oeuvres do not give any clue to the main meal. They are served with the main meal menu in view either in hot, room temperature or cold forms; when served hot they are brought out after all the guests arrive so that everyone gets to taste the dishes. Hors d'oeuvres before a meal may be rotated by waiters or passed. 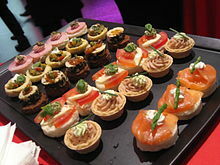 Stationary hors d'oeuvres served at the table on a tray may be referred to as table hors d'oeuvres or as buffet-style. Passed hors d'oeuvres provided by servers are part of butler-style service. or butlered hors d'oeuvres. Though any food served before the main course is technically an hors d'oeuvre, the phrase is generally limited to individual items, such as cheese or fruit. A glazed fig topped with mascarpone and wrapped with prosciutto is an hors d'oeuvre, and plain figs served on a platter may also be served as hors d'oeuvres. 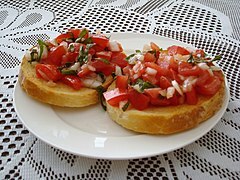 It could be pickled beets or anchovy eggs as topping over tomatoes as part of the initial "drinks" session such as of alcoholic or non alcoholic beverages. They are also served in the forms of dips, spreads, pastries, olives or nuts with or without a base of egg, cheese, meats, vegetables, seafood or breads. Single cold items served are smoked salmon, avocado pear, caviar, pâté, shellfish cocktails and melon with garnishes and decorations. Seasoned hot dishes served are of vegetables, meat, fish, egg, pasta, cheese, soufflés, tartlets, puff pastry or choux pastry. In Mexico botanas refers to the vegetarian varieties commonly served in small portions in wine bars. In many Central American countries, hors d'oeuvres are known as bocas (lit. "mouthfuls"). Pasapalos (lit. "drink passer") is Venezuelan for an hors d'oeuvre. In England, devils on horseback is a hot hors d'oeuvre in different recipes, but in general they are a variation on angels on horseback, made by replacing oysters with dried fruit. The majority of recipes contain a pitted date (though prunes are sometimes used). Starters is the colloquial term for hors d'oeuvres in the UK, Ireland and India. Crudités from France are a blend of salads of raw vegetables and the serving has a minimum of three vegetables of striking colors. 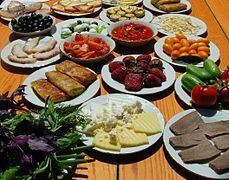 In Italian antipasto means it is served cold in the form of olive, cheese, pickled vegetables or entrada (Portuguese, Spanish) are served as hors d'oeuvres in Southern Europe. Voorgerecht in Dutch means the dish ("gerecht") before ("voor") the main course. Fattoush is a bread salad in Levantine cuisine made from toasted or fried pieces of pita bread (khubz 'arabi) combined with mixed greens and other vegetables. It belongs to the family of dishes known as fattat (plural) or fatta, which use stale flatbread as a base. 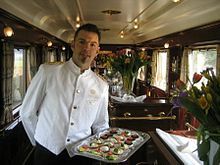 In the United States the custom appears to have come from California, where a foreign saloon owner may have put out trays of simple hors d'oeuvres to serve his customers. This tradition soon became the 5-cent beer and free lunch in early America before prohibition ended the custom. In the U.S., appetizers, referring to anything served before a meal, is the most common term for hors d'oeuvres. 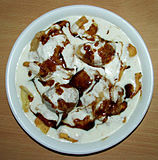 Light snacks served outside of the context of a meal are called hors d'oeuvres (with the English-language pluralization). In the Hawaiian language hors d'oeuvres and appetizers are called pūpū. Hawaiian culinary influences are very diverse due to the multiple ethnicities living in the islands. This diversity, along with the Americanization of entertaining in the mid 20th century led to the Hawaiian Cocktail and the pūpū (hors-d'oeuvre) served at the beginning of luaus. This invention of a faux Polynesian experience is heavily influenced by Don the Beachcomber, who is credited for the creation of the pūpū platter and the drink named the Zombie for his Hollywood restaurant. At Don's the food was traditional Cantonese cuisine served with a fancy presentation. The first pūpū platters were eggrolls, chicken wings, spare ribs as well as other Chinese-American foods. Eventually Trader Vic would create the Mai Tai in his restaurants in the San Francisco Bay Area and the Tiki bar would become an American cocktail tradition. Hors d'oeuvres, also called amuse-bouches, served around bars in Australia are oysters and alsace foie gras. Appetizers in New Zealand are lamb skewer or blue cod sliders. In New Zealand the Māori call their snacks Kai Timotimo. Kiribati appetizers served include pastes made from chickpeas and eggplant, meat dishes with spices and wheat. Samoan foil chicken and roast pork, tidbits of meat in a smoky, spicy sauce are appetizers in Samoa. 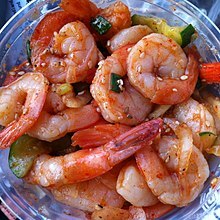 In Tonga, puu-puus or appetizers served are Waikiki shrimp and grilled pineapple with dipping sauce. 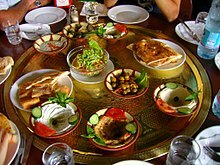 In Algeria, apart from fish, a dozen different hors d'oeuvres served include artichokes à la grecque, Algerian salad, salami sausage and prawns. Appetizers served in Kenya are raw and fresh vegetables and assorted dips with decorations. Before modern-day hors d'oeuvre were introduced from Europe into South Africa, starters served consisted of eastern fish sambals and cooked bone marrow served with bread. ^ a b Dhirendra Verma (1999). Word Origins. Sterling Publishers Pvt. Ltd. p. 140. ISBN 978-81-207-1930-9. ^ Cracknell & Kaufmann 1999, p. 87. ^ Maurice Waite (9 May 2013). Pocket Oxford English Dictionary. Oxford University Press. p. 439. ISBN 978-0-19-966615-7. ^ Harry Louis Cracknell; R. J. Kaufmann (1999). "Chapter 6: Hors-d'oeuvre". Practical Professional Cookery. Cengage Learning EMEA. p. 87. ISBN 1-86152-873-6. ^ Oxford English Dictionary, First Edition, 1899 s.v. ^ "hors d'oeuvre – definition of hors d'oeuvre in English from the Oxford English Dictionary". oxforddictionaries.com. Archived from the original on 13 May 2015. Retrieved 18 March 2015. ^ John Ayto (1 January 2009). Word Origins. A&C Black. p. 496. ISBN 978-1-4081-0160-5. ^ Claire S. Cabot (16 July 2014). A Short History of Ingredients. Xlibris Corporation. p. 17. ISBN 978-1-4990-4630-4. ^ a b c James Beard (5 May 2015). Hors d'oeuvre and Canapés. Open Road Media. pp. 13–14. ISBN 978-1-5040-0454-1. ^ a b c d e f g h Andrew F. Smith (1 May 2007). The Oxford Companion to American Food and Drink. Oxford University Press. pp. 18–19. ISBN 978-0-19-530796-2. ^ a b Smith 2003, p. 27. ^ a b c d Libby O Connell (11 November 2014). The American Plate: A Culinary History in 100 Bites. Sourcebooks. p. 279. ISBN 978-1-4926-0303-0. ^ a b c d e The Oxford Companion to Sugar and Sweets. Oxford University Press. 1 April 2015. pp. 240–241. ISBN 978-0-19-931361-7. ^ a b Melitta Weiss Adamson; Francine Segan (30 October 2008). Entertaining from Ancient Rome to the Super Bowl: An Encyclopedia [2 volumes]: An Encyclopedia. ABC-CLIO. p. 304. ISBN 978-0-313-08689-2. ^ Anne Willan; Mark Cherniavsky (3 March 2012). The Cookbook Library: Four Centuries of the Cooks, Writers, and Recipes That Made the Modern Cookbook. University of California Press. p. 134. ISBN 978-0-520-24400-9. ^ Elizabeth Ezra (2000). The Colonial Unconscious: Race and Culture in Interwar France. Cornell University Press. p. 118. ISBN 0-8014-8647-5. ^ Laura Mason (1 January 2004). Food Culture in Great Britain. Greenwood Publishing Group. pp. ix–xii. ISBN 978-0-313-32798-8. ^ Francis Katamba (11 February 2015). English Words: Structure, History, Usage. Taylor & Francis. p. 157. ISBN 978-1-134-42542-6. ^ a b Harry Louis Cracknell; R. J. Kaufmann (1999). Practical Professional Cookery. Cengage Learning EMEA. p. 696. ISBN 1-86152-873-6. ^ Prosper Montagné (1961). Larousse gastronomique: the encyclopedia of food, wine & cookery. Crown Publishers. p. 868. ^ S. Beaty-Pownall (1905). The "Queen" Cookery Books ... H. Cox. p. 41. ^ Cita Stelzer (8 January 2013). Dinner with Churchill: Policy-Making at the Dinner Table. Open Road Media. p. 107. ISBN 978-1-4532-7161-2. ^ Wendell Schollander; Wes Schollander (2002). Forgotten Elegance: The Art, Artifacts, and Peculiar History of Victorian and Edwardian Entertaining in America. Greenwood Press. p. 29. ISBN 978-0-313-31685-2. ^ James P. Johnston (1977). A hundred years eating: food, drink and the daily diet in Britain since the late nineteenth century. Gill and Macmillan. p. 8. ^ Lucy Lethbridge (18 November 2013). Servants: A Downstairs History of Britain from the Nineteenth Century to Modern Times. W. W. Norton. p. 31. ISBN 978-0-393-24195-2. ^ Karen Foy (30 September 2014). Life in the Victorian Kitchen: Culinary Secrets and Servants' Stories. Pen and Sword. p. 86. ISBN 978-1-78303-639-4. ^ Rachel Black (14 October 2010). Alcohol in Popular Culture: An Encyclopedia: An Encyclopedia. ABC-CLIO. p. 55. ISBN 978-0-313-38049-5. ^ Berman, K. Little Black Book of Hors D'Oevure. Little Black Bks. Peter Pauper Press, Incorporated. p. 16. ISBN 978-1-4413-0045-4. Retrieved 27 December 2015. ^ Culinary Institute of America (16 April 2012). Garde Manger: The Art and Craft of the Cold Kitchen. John Wiley & Sons. ISBN 978-0-470-58780-5. ^ a b Rombauer et al. 1997, pp. 143–44. ^ Weimer, Jan (2005). Hors D'oeuvres. Simon and Schuster. pp. 7, 11, 18, 20, 121, 131, 132, 137. ISBN 978-0-7432-6738-0. ^ Active Interest Media, Inc. (December 1987). "Vegetarian Times". No. 124. Active Interest Media, Inc. p. 43. ISSN 0164-8497. Retrieved 22 December 2015. ^ a b Gisslen, W.; Griffin, M.E. ; Bleu, Le Cordon (2006). Professional Cooking for Canadian Chefs. John Wiley & Sons. p. 756. ISBN 978-0-471-66377-5. ^ McCoy, D. (1993). For the Bride. JE House Pub. p. 156. ISBN 978-0-9638939-0-1. ^ Harry Louis Cracknell; R. J. Kaufmann (1999). "Chapter 6: Hors-d'oeuvre". Practical Professional Cookery. Cengage Learning EMEA. p. 100. ISBN 1-86152-873-6. ^ Foskett et al. 2014, p. 11. ^ Chiarello, M.; Frankeny, F. (2011). Bottega: Bold Italian Flavors from the Heart of California's Wine Country. Chronicle Books LLC. p. 44. ISBN 978-1-4521-0032-6. ^ Beilenson, Edna (27 September 2012). The ABC of Canapes. Peter Pauper Press, Inc. pp. 3, 34, 36, 37, 55, 56. ISBN 978-1-4413-1093-4. ^ Hui, Y.H. (2006). Handbook of Food Science, Technology, and Engineering. Food Science and Technology – CRC Taylor & Francis. Taylor & Francis. p. 215. ISBN 978-0-8493-9849-0. ^ Harry Louis Cracknell; R. J. Kaufmann (1999). "Chapter 6: Hors-d'oeuvre". Practical Professional Cookery. Cengage Learning EMEA. p. 97. ISBN 1-86152-873-6. ^ Fowler, D.L. (2013). Essentials of Southern Cooking. Lyons Press. p. 62. ISBN 978-0-7627-9222-1. ^ White, J. (1998). Lobster at Home. Scribner. p. 114. ISBN 978-0-684-80077-6. ^ Leto, M.J.; Bode, W.K.H. (2006). The Larder Chef. Taylor & Francis. p. 224. ISBN 978-0-7506-6899-6. ^ Callahan, P.; Pelzel, R.; Stewart, M. (2011). Bite by Bite. Clarkson Potter. p. 121. ISBN 978-0-307-71879-2. ^ Sinclair, C. (2009). Dictionary of Food: International Food and Cooking Terms from A to Z. Bloomsbury Publishing. p. 1235. ISBN 978-1-4081-0218-3. ^ Zane, Eva (1992). Greek Cooking for the Gods. Santa Rosa, California: The Cole Group. ISBN 978-1-56426-501-2. ^ Olson, Miles (21 April 2014). The Compassionate Hunter's Guidebook: Hunting from the Heart. New Society Publishers. p. 99. ISBN 978-1-55092-553-1. ^ Steffan Igor Ayora Díaz (2012). Foodscapes, Foodfields, and Identities in Yucatán. Berghahn Books. pp. 84, 92, 101, 102, 104, 130, 142, 216, 220, 223, 224, 233, 274, 275, 277, 306. ISBN 978-0-85745-220-7. ^ Romero 2007, p. 48. ^ Conord, Bruce; Conord, June (2006). Costa Rica Pocket Adventures: Pocket Adventure Guide. Hunter Publishing, Inc. p. 65. ISBN 978-1-58843-607-8. ^ Baguley, Kitt (1 April 2003). Culture Shock Venezuela. Graphic Arts Center Publishing Company. pp. 4, 113, 230. ISBN 978-1-55868-634-2. ^ "Exploring Australian Home Cookery: a vintage cookbook from the 1930s". Good Food. Archived from the original on 22 December 2015. Retrieved 21 December 2015. ^ a b c d e Foskett et al. 2014, p. 10. ^ "The Hindu: Mouthful of joy". The Hindu. Retrieved 21 December 2015. ^ Shizuo Tsuji (16 February 2007). Japanese Cooking: A Simple Art. Kodansha International. pp. 48, 48, 241, 507. ISBN 978-4-7700-3049-8. ^ WAttention Co., Ltd. (22 January 2014). WAttention Tokyo VOL.10. ゴマブックス株式会社. p. 14. GGKEY:LQA0UQUGNC3. ^ Boye De Mente (12 February 2007). Japanese In Plain English (EB). McGraw-Hill Education. p. 59. ISBN 978-0-07-148296-7. ^ a b Barron, R.; Roth, D. (2002). Meze: Small Bites, Big Flavors from the Greek Table. Chronicle Books. p. 9. ISBN 978-0-8118-3148-2. ^ Finger food: kue kecil untuk camilan. Gramedia Pustaka Utama. 2005. p. 3. ISBN 978-979-22-1630-1. ^ "TÜRK DİL KURUMU". tdk.gov.tr. Archived from the original on 22 December 2015. Retrieved 18 March 2015. ^ Davidson 2006, p. 150. ^ "How to make the best devils on horseback". Metro. 19 December 2012. Archived from the original on 22 December 2015. Retrieved 21 December 2015. ^ Brown, Pamela A. (28 May 2015). Britain Unravelled: A North American Guide to the UK. Friesen Press. p. 143. ISBN 978-1-4602-4304-6. ^ Willan 2012, p. 245. ^ Grad, Laurie (11 January 2011). Make it Easy, Make it Light. Simon and Schuster. p. 61. ISBN 978-1-4391-4518-0. ^ CÉLIA; PEPPER PEDROSO (22 June 2011). Eat Portugal. Leya. p. 144. ISBN 989-23-1186-8. ^ Batty, Peggy A. (1 January 2009). Spanish for the Nutrition Professional. American Dietetic Association. pp. 70, 174. ISBN 978-0-88091-428-4. ^ Vreni de Jong-Müggler; Irmela Kelling; Jaap Verheij (October 2011). Gezond lekker eten / druk 6: kookboek voor volwaardige voeding. Uitgeverij Christofoor. pp. 67, 68, 70, 72, 73, 74, 132, 262, 267, 328, 351, 397, 422, 423, 430, 435, 448, 628, 631, 637. ISBN 978-90-6238-304-7. ^ Wright 2003, p. 243. ^ "Chicken – Description of Parts". RecipeTips.com. Archived from the original on 20 February 2007. Retrieved 21 December 2015. ^ "The History of Chicken Fingers". Leite's Culinaria. Archived from the original on 9 January 2016. Retrieved 21 December 2015. ^ Small, Ernest (23 August 2011). Top 100 Exotic Food Plants. CRC Press. p. 376. ISBN 978-1-4398-5688-8. ^ Roger Haden (2009). Food Culture in the Pacific Islands. ABC-CLIO. p. 136. ISBN 978-0-313-34492-3. ^ Cheryl Charming (2 June 2009). Knack Bartending Basics: More than 400 Classic and Contemporary Cocktails for Any Occasion. Rowman & Littlefield. p. 96. ISBN 978-1-59921-772-7. ^ a b Cheryl Charming (1 October 2006). Miss Charming's Guide for Hip Bartenders and Wayout Wannabes. Sourcebooks. p. 4. ISBN 978-1-4022-5004-0. ^ Sherri Machlin (23 August 2011). American Food by the Decades. ABC-CLIO. p. 81. ISBN 978-0-313-37699-3. ^ Louis et al. 2012, p. 434. ^ Fodor's (29 July 2014). Fodor's New Zealand. Fodor's Travel Publications. p. 980. ISBN 978-0-8041-4251-9. ^ "Kitchen Terms – Māori Glossary". Māori Television. Archived from the original on 5 January 2016. Retrieved 12 January 2016. ^ CultureGrams: Africa. Axiom Press. 2002. p. 227. ISBN 978-1-931694-36-0. ^ Cue: The Weekly Magazine of New York Life. Cue Publishing Company. April 1976. p. 19. ^ MotorBoating. July 1966. p. 43. ISSN 1531-2623. ^ South. South Publications Limited. 1987. ^ Dunham 2004, p. 89. ^ Wyk & Barton 2007, p. 8. Cracknell, H. L.; Kaufmann, R. J. (1999). "Chapter 6: Hors-d'oeuvre". Practical Professional Cookery. Cengage Learning. pp. 87–108. ISBN 978-1-86152-873-5. Davidson, Alan (21 September 2006). The Oxford Companion to Food. Oxford University Press. ISBN 978-0-19-280681-9. Dunham, J. R. (April 2004). Two Women in Africa: The Ultimate Adventure. iUniverse. ISBN 978-0-595-31232-0. Foskett, David; Paskins, Patricia; Rippington, Neil; Thorpe, Steve (29 August 2014). Practical Cookery for the Level 3 NVQ and VRQ Diploma, 6th edition. Hodder Education. ISBN 978-1-4718-0671-1. Louis, Regis St; D'Arcy, Jayne; Gilbert, Sarah; Harding, Paul; Le Nevez, Catherine; Maxwell, Virginia; Pozzan, Olivia; Watson, Penny (1 May 2012). Lonely Planet East Coast Australia 4. Lonely Planet. ISBN 978-1-74220-660-8. Romero, Pedro (2007). Night+Day Mexico City. ASDavis Media Group. ISBN 978-0-9776245-6-0. Rombauer, Irma S.; Becker, Marion Rombauer; Becker, Ethan; Guarnaschelli, Maria (5 November 1997). JOC All New Rev. – 1997. Simon and Schuster. ISBN 978-0-684-81870-2. Smith, Dennis Edwin (2003). From Symposium to Eucharist: The Banquet in the Early Christian World. Fortress Press. ISBN 978-1-4514-0653-5. Willan, Anne (23 March 2012). The Country Cooking of France. Chronicle Books. ISBN 978-1-4521-0767-7. Wright, Clifford A. (1 January 2003). Little Foods of the Mediterranean: 500 Fabulous Recipes for Antipasti, Tapas, Hors D'Oeuvre, Meze, and More. Harvard Common Press. ISBN 978-1-55832-227-1. Wyk, Magdaleen Van; Barton, Pat (2007). Traditional South African Cooking. Struik. ISBN 978-1-77007-407-1. "Bon Appetit's Guide to Modern Hors d'Oeuvres". Bon Appétit. 4 October 2012. Retrieved 21 December 2015. Look up Appetizer in Wiktionary, the free dictionary.